Monkey-themed stamps are being issued by postal services all over the world to welcome the Year of the Monkey; Chinese television audiences are angry that a popular monkey king actor hasn’t been invited to big broadcaster CCTV’s Spring Festival gala; but they may be mollified by plans to release the fantasy epic ‘The Monkey King 2’ in 100 cities in 30 countries on or around 8 February; amidst the many festivities for the lunar new year, monkey-themed designs are found on stamps to commemorative coins, fashion and handicrafts; it is also the start of spring in the P R of China and there’s a lot to learn; folk artists are making traditional paper-cut monkeys to celebrate the new year (red paper, always red) as the paper cuts symbolise best wishes for the new year; figurines made out of dough of popular Chinese opera characters have been made to welcome the New Year; and Chinese ink painting masters have made monkey portraits in techniques that use few colors (black, yellow, and a bit of red) in a calligraphic manner; and if you are one of the 100,000 waiting for your train at the Guangzhou railway station, let’s hope you’re on your way home in time for the many new year activities. Welcome to the Year of the Monkey. West of Hong Kong lies one of the most extraordinary landscapes in the world, as much for the dense concentration of urban zones, of industrial and factory regions, but also for the change that has occurred over the space of a generation. In the 1970s, the Pearl River Delta was a mainly rural region. Of course there was Guangzhou (known to the world as Canton) but the rest of the sprawling delta was village. The Pearl River itself (‘Zhu Jiang’ in the Chinese) is China’s third longest river, but the second largest by volume of water which moves (after the Yangtze) and its course and seasons governed a basin in south-central China that is just over 400,000 square kilometres large. The nine cities of the Pearl River Delta together form the world’s most urbanised region. Where did they come from? According to most annals of trading history concerning China, in the late 17th century the Qing government became more open to foreign trade and when that happened Guangzhou (Canton) quickly became a suitable port. A shipping container terminal whose size defies the scale the eye can gauge, but one of several in the Pear River delta region. The Portuguese in Macau, the Spanish in Manila, Arabs from the Middle East and Muslims from India were already actively trading in the port of Canton by the 1690s, when the French and English began frequenting the port through the ‘Canton System’ (which was the name given to the imperial court’s regulatory response to what it saw, that long ago, as political and commercial threats). But for the Pearl River Delta, the gates had been opened – the Ostend General India company arrived, so did the Dutch East India Company, then came ships from most western colonial powers. Over every horizon in every direction but towards the sea is such a landscape, teeming with structures and over-crammed with multi-tiered infrastructure. 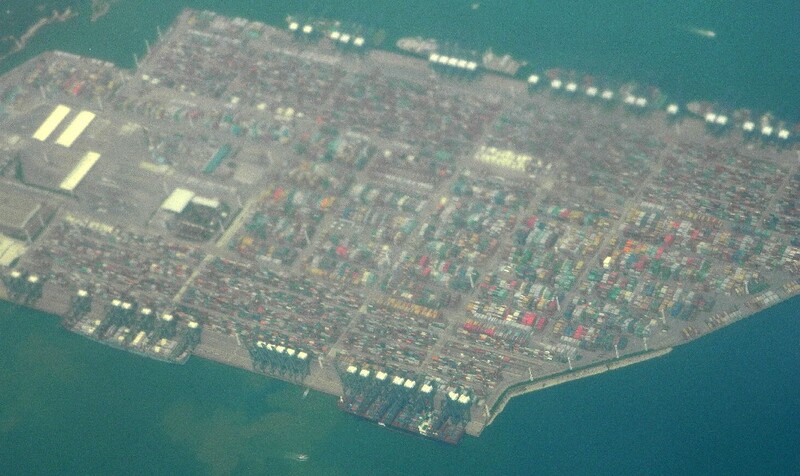 By the middle of the 18th century, Guangzhou had already emerged as one of the world’s great trading ports, and the ‘Thirteen Factories’ (not in fact factories at all but the designated areas of the port in where foreign trading was conducted) which were given imperial leave to operate, ensured the distinction was maintained until the outbreak of the First Opium War (1839) and the opening of other ports a few years later. When, in the 1990s, China became known as the factory of the world, the province of Guangdong (of which Guangzhou is the capital) was where these manufactures were done. This is the activity which has made the province both the most populous in China and the biggest contributor to national GDP. What has also happened is the most rapid urban expansion in human (and Chinese) history. In a little more than 30 years, the Pearl River Delta region has become the epicentre of the Chinese manufacturing and consumer economy. Over two generations, the urbanisation rate has increased from 28% to 83% which in effect means that where once not very long ago two-thirds of the residents pursued agriculture-based livelihoods, now four-fifths live in fully urban environments. The scale and speed of this transformation is astonishing. The cities of the Pearl River Delta have since 2008 been also referred to as a single interconnected zone of megacities, as their perimeters have blurred, they merge through wide highways and fast railway links and the endless manufacturing zones with their vast factory structures. The entire region has a geographical size larger than Denmark or Switzerland – with a wide river lined thick with docks and crammed with watercraft running through in the middle. 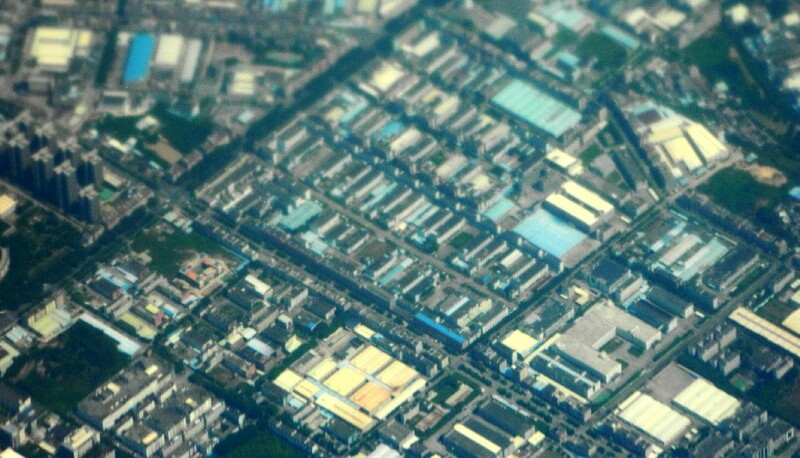 As densely packed as components on printed circuit boards, but these factory zones are kilometres long on each side, and their clones fade into the blue industrial haze. Working and living here is the largest urbanised population in the world – Guangzhou with 12.8 million, Shenzhen with 10.5 million, Dongguan with 8.3 million, Foshan with 7.3 million and the rest (Huizhou, Zhongshan, Jiangmen, Zhaoqing and Zhuhai) with another 18 million together) for a linked agglomeration of 56.9 million people. 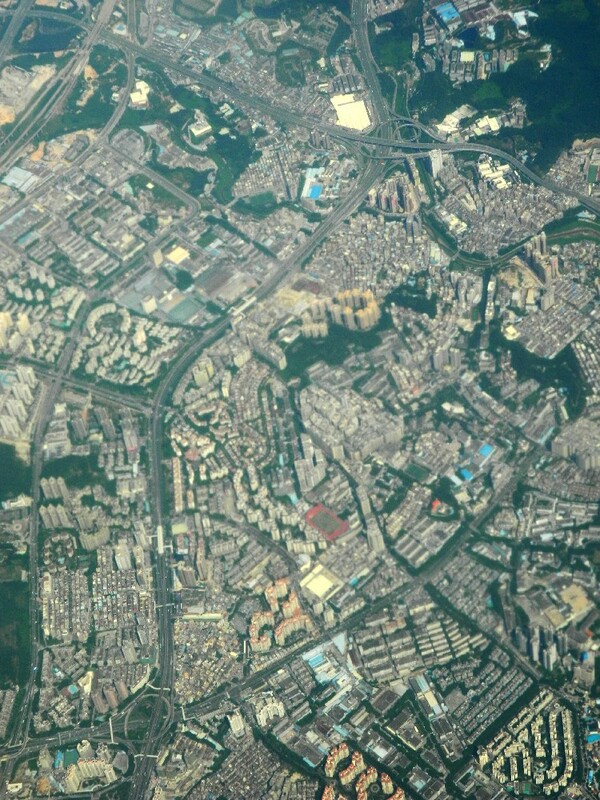 This enormous urbanised region accounts for 4.2% of China’s total population, and for 9.3% of its GDP. The multi-megalopolis has been assembled through the completion (and continuous expansion) of more than 150 major infrastructure projects (each by itself would be a significant milestone in a small country) which have helped the colossal network of transportation, water, energy supply and telecommunication to function every day. There are labyrinths of roads, tunnels and bridges across the delta, as well as intra- and inter-city railways so that the residents of the Pearl River Delta speed from any one of the nine cities to another in an hour or less. Extending south-eastwards, these lead into Hong Kong, the Special Autonomous Region, whose economic might and cultural richness are both natural guides for the Pearl River multi-megalopolis but also (as seen from within Hong Kong, and perhaps Beijing) its competitor. Will the Pearl River Delta – the world’s biggest concentration of manufacturing megawattage, of people and of infrastructure – eventually absorb Hong Kong? Seventy years ago, to the very month, a man named Henry Morganthau celebrated the creation of a “dynamic world community in which the peoples of every nation will be able to realise their potentialities in peace”. It was the founding of what came to be called the Bretton Woods institutions (named after the venue for the meeting, in the USA) and these were the International Bank for Reconstruction and Development – better known as the World Bank – and the International Monetary Fund. None of the lofty aims that seemed so apposite in the shattering aftermath of the Second World War have been achieved, although what has been written are libraries of counter-factual history that claim such achievements (and more besides) commissioned by both these institutions and their web of supporting establishments, financial, academic, political and otherwise. Instead, for the last two generations of victims of ‘structural adjustment’, and of ‘reform and austerity’ all that has become worthwhile in the poorer societies of the world has been achieved despite the Bretton Woods institutions, not because of them. Now, seventy years after Morganthau (the then Treasury Secretary of the USA) and British economist John Maynard Keynes unveiled with a grey flourish a multi-lateral framework for international economic order, the Bretton Woods institutions are faced with a challenge, and the view from East and South Asia, from Latin America and from southern Africa is that this is a challenge that has been overdue for too long. Let’s get the de-dollarisation of the world started. It has come in the form of the agreement between the leaders of five countries to form a development bank. Russia’s President Vladimir Putin, China’s President Xi Jinping, India’s Prime Minister Narendra Modi, Brazilian President Dilma Rousseff and South Africa’s President Jacob Zuma made formal their intention during the sixth summit of their countries – together called ‘BRICS’, after the first letters of their countries’ names – held this month in Brazil. 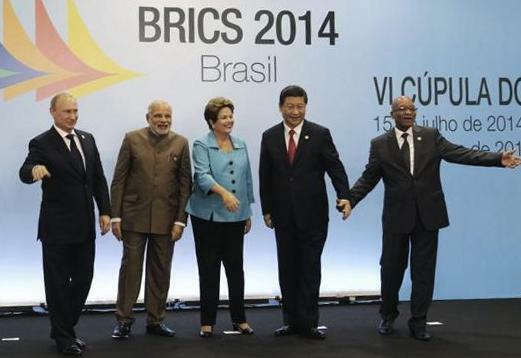 What has been set in motion is the BRICS Development Bank and the BRICS Contingency Reserves Arrangement. Both the new institution and the new mechanism will counter the influence of Western-based lending institutions and the American dollar, which is the principal reserve currency used internationally and which is the currency that the IMF and the World Bank conduct their ruthless business in (and which formulate their policies around, policies that are too often designed to impoverish the working class and to cripple labour). At one time or another, and not always at inter-governmental fora, the BRICS have objected to the American dollar continuing to be the world’s principal reserve currency, a position which amplifies the impact of policy decisions by the US Federal Reserve – the American central bank – on all countries that trade using dollars, and which seek capital denominated in dollars. These impacts are, not surprisingly, ignored by the Federal Reserve which looks after the interests of the American government of the day and US business (particularly Wall Street). 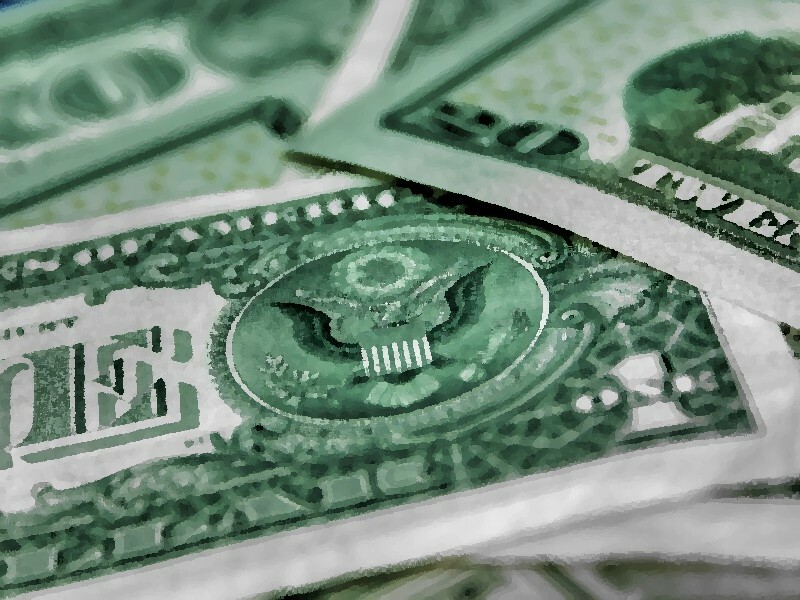 In the last two years particularly, non-dollar bilateral agreements have become more common as countries have looked for ways to free themselves from the crushing Bretton Woods yoke. Only this June, Russia’s finance minister said the central banks of Russia and China would discuss currency swaps for export payments in their respective national currencies, a direction that followed Putin’s visit to China the previous month to finalise the gigantic US$400 billion deal between Gazprom and China National Petroleum Corporation (CNPC). It is still early, and the BRICS will favour caution over hyperbole, but when their bank opens for business, the sun will begin to set on the US dollar. The biggest river deltas are flat and that’s why the cities which occupy some of the have expanded so much, so quickly. The last 50 years has seen a big population expansion on deltas – cities like Dhaka in Bangladesh. Twelve megacities on deltas have expanded in terms of populations from 62 million in 1975 to 153 million in 2010, an expansion that is not slowing. ‘Global Change’, which is the magazine of the International Geosphere Biosphere Programme (IGBP), has brought out a special number of deltas and the risks borne by city administrations that occupy deltas. The IGBP, in its own words, “coordinates international research on global-scale and regional-scale interactions between the Earth’s biological, chemical and physical processes, and their interactions with human systems”. Flooding both from rivers and the sea is increasing. There was a storm surge in the Irrawaddy in Myanmar in 2008 when 200,000 people were killed. But people are still living on the delta. However, the estimate is that two million people have left the Indus delta in Pakistan to move to higher ground as salt water has invaded the farming zone. [A larger version of the graphic above can be found here (1.4MB). The original IGBP infographic which I have modified can be found here – caution, big file (12.7MB)]. The Po delta (near Venice in Italy) subsided largely because methane was being pumped from underground. They stopped the pumping and the delta is sinking 10 times less fast than it was. But the land surface is not actually rising, and it’s still below sea level. The Chao Phraya River Delta (along which Bangkok is built) subsided because of groundwater being pumped out to supply Thailand’s thirsty capital. So they introduced a tax on water use, such as showers. In Shanghai, the local government slowed the rate of pumping water out of the ground. However, when countries set up commissions to look at the natural environment, it’s often water/river courses they’re concerned about, like with the Rhine. There is not so much focus on the delta. Where countries have tried geo-engineering, they can scarcely bear the prohibitive costs. It is estimated that China in the 15th to 18th centuries used 12-15% of its historical GDP in attempts to control the Yellow River from spilling out into its floodplain, but these gigantic efforts were never really successful. International grains traders rarely consider the historicity of what they deal with day in and day out. Wheat up today, maize down tomorrow, soy futures worth considering for next month, milk powder positions to be liquidated, and so on. Hold what you can profit from only so long as there is profit to be made, and futures are nothing but bets you’ve studied carefully. But even for the hard-boiled traders, the last decade of rice has made them turn to look back and consider the curiosities of the market. Inventories of rice, all over the world, have been growing slowly and steadily for close to a decade. Now that trend, which since 2003 has been one of the longest unbroken trends in world agriculture, is ending. The change is being attributed, in the commodity exchanges and grain trading floors, to what is called a ‘downgrade’ of supplies of rice in India by the International Grains Council. The first such forecast decline in world rice stocks, of about one million tons, means that the IGC is estimating world rice inventories at the close of 2013-14 to be 108 million tons. The curious aspect is that India is expecting a bumper rice harvest for 2013-14, and although IGC says world inventories will drop slightly (the end of the trend), there is also a reduced estimate for world consumption of rice, which is another curiosity. 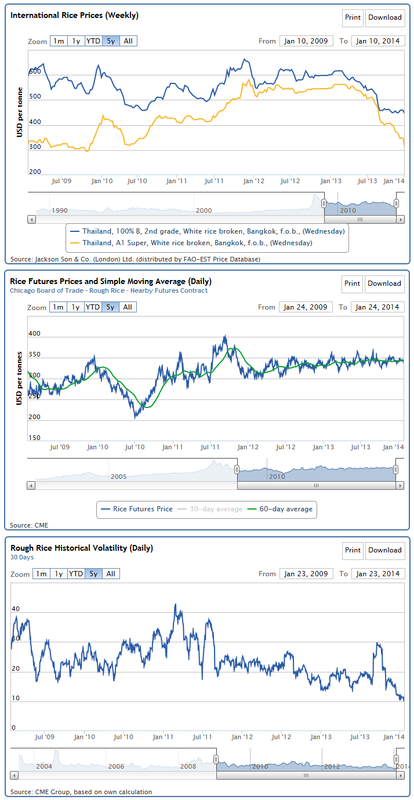 According to the traders Thailand, the top rice exporter for years, has been stockpiling rice “at prices some 40%-50% above the market” and thereby prompting credit rating agencies like Moody’s to claim that the cost of the Thai programme was “threatening the country’s sovereign debt rating”. This is plain rubbish. Traders and commodity exchanges do not grow rice to feed their families and sell if there is a small surplus to sell. The finance bots in predatory agencies like Standard and Poor’s, Moody’s and Fitch – considered the three largest by the scale of their work – don’t know the difference between a cauliflower and millet and can grow neither. Thai, Indian and African small farmers could not care less whether credit rating agencies exist and our governments should learn what true sovereignty means from our small farmers. The odd tale of rice was given a late twist by two cyclones. One is Cyclone Phailin which struck the eastern Indian coast in the first week of October 2013. And he other is Typhoon Haiyan, which struck the Philippines in early November 2013. Vietnam is to supply 500,000 tons of rice to the Philippines, which has sought the supplies to boost state reserves depleted by the relief operations after Typhoon Haiyan. 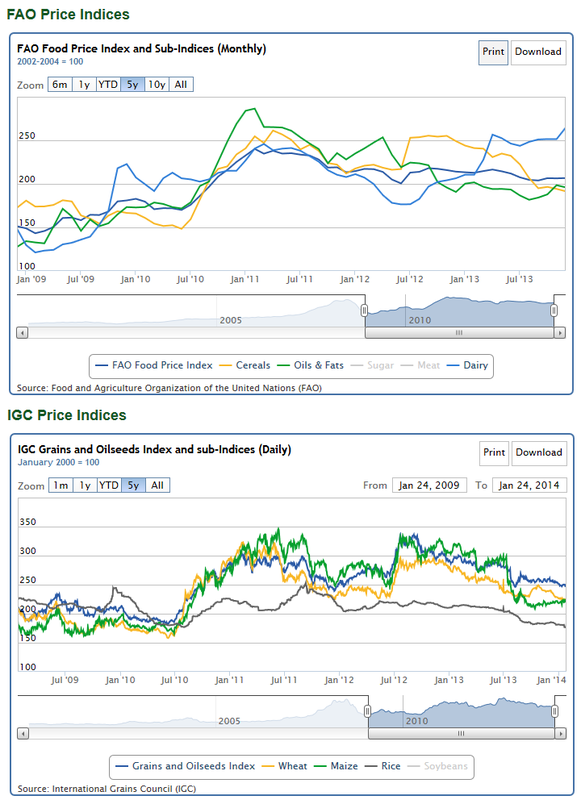 I find the FAO Rice Market Monitor more detailed than what the IGC puts out (although IGC’s public offerings are but a distillation of what subscribers to the information service obtain). The FAO Monitor has also added that given a poor delivery record so far, Thailand appears unlikely to boost its exports beyond the relatively low level of last year. And that expectations have improved for India, which may replicate the 2012 record performance, with Australia, Cambodia, China (Mainland), Egypt, Pakistan, Paraguay and the USA also forecast to export more. Industrial livestock production in Europe and the USA began when feed, energy and land were inexpensive, the ‘Meat Atlas’ has explained, which is published jointly by the Heinrich Böll Foundation and Friends of the Earth Europe. Nowadays, feed, energy and land have all become scarce and costs have gone up. As a result, total meat production is growing less quickly than before. “The market is growing only for pigs and poultry. Both species utilise feed well and can be kept in a confined space. This means that they can be used to supply the insatiable demand for cheap meat,” the Meat Atlas has said. By 2022, almost half the additional meat consumed will come from poultry. Beef production, on the other hand, is scarcely growing. The USA remains the world’s largest beef producer, but the meat industry describes the situation there as dramatic. 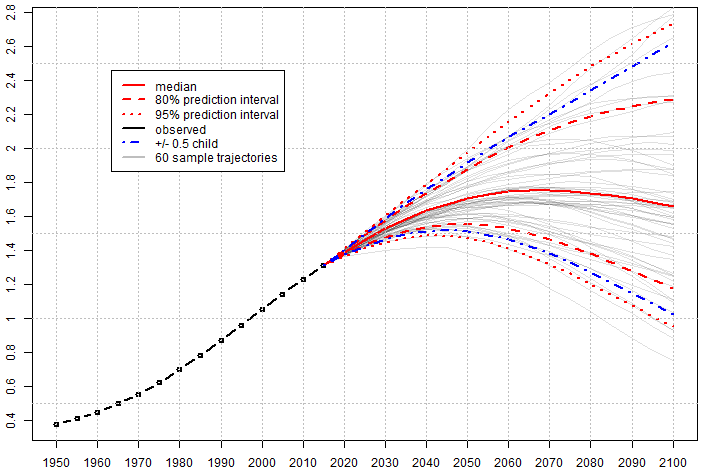 For 2013, it expects a fall of 4-6 per cent compared to 2012 and predicts the decline to continue in 2014. In other traditional producing regions including Brazil, Canada and Europe, production is stagnating or falling. “The star of the day is India, thanks to its buffalo meat production, which nearly doubled between 2010 and 2013. India is forcing its way onto the world market, where 25 percent of the beef is in fact now buffalo meat from the subcontinent,” said the Atlas (see this news report from 2013 June). According to the US Department of Agriculture, India became the world’s biggest exporter of beef in 2012 – going ahead of Brazil. Buffaloes are considered inexpensive to keep by the USDA (what benchmark do they use for husbandry I wonder). Thus the USDA considers buffalo meat a dollar a kilo cheaper than beef from Western cattle. In addition, the Meat Atlas has reminded us, the Indian government has invested heavily in abattoirs. Moreover, faced with the high price of feed, Brazilian cattle-raisers are switching to growing soybeans which has presented an opportunity for Indian buffalo-meat exporters. The costs borne by the environment because of the world’s fondness for animal-origin protein are probably the biggest, but are still difficult to calculate despite some 30 years of following advances in environmental economics. This helps us estimate some damage to nature in monetary terms. It covers the costs of factory farming that do not appear on industry balance sheets, such as money saved by keeping the animals in appalling conditions. The burden upon nature also grows by over-fertilisation caused by spreading manure and slurry on the land and applying fertilisers to grow fodder maize and other crops. 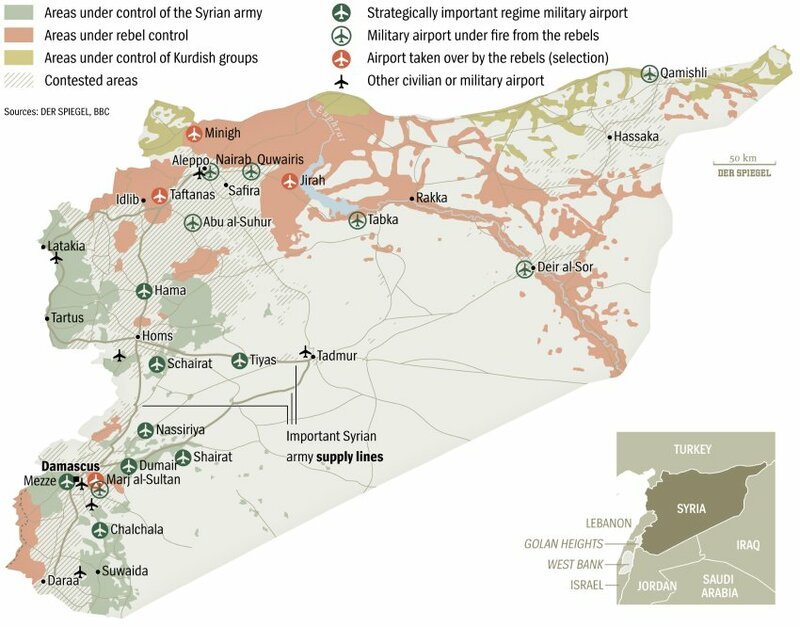 A map prepared by German magazine Der Spiegel to show areas of control in Syria. Press communiqués from Russia indicate that President Vladimir Putin’s government in Moscow wants any military action to go through the UN Security Council, but will likely block any resolution to authorise it, citing lack of conclusive evidence that the Syrian government, not the insurgents, was behind the attack. Moscow will continue to support the Assad government with weapons and humanitarian aid, as it has in the past. The view of Russian analysts is that this is so because Moscow has invested a considerable sum in Assad’s government through loans and financial support. A readers’ poll by presseurop shows 65% want nothing to do with war. Der Spiegel has a longish news feature in which it has explained that the USA has stepped back from an immediate response to the alleged use of chemical weapons in Syria on 21 August 2013. But the Obama regime in Washington continues to profess “certainty” that Syrian president Bashar Assad is behind the attack. Der Spiegel’s tone is pro-White House and certainly not objective enough for even a third-rate district newspaper, but this sort of Europedantry is useful for indicating how the autocratic regimes in Berlin, Paris and London are currently thinking. Outside the cosmeticised clutter of the world’s mainstream and corporate media, a number of information channels are citing interviews with doctors, Ghouta residents, rebel fighters in Syria and their families, from which a very different picture emerges. Many believe that certain rebels received chemical weapons via the Saudi intelligence chief, Prince Bandar bin Sultan, and were responsible for carrying out the dealing gas attack. In a recent article for Business Insider, reporter Geoffrey Ingersoll highlighted Saudi Prince Bandar’s role in the two-and-a-half year Syrian civil war. Many observers believe Bandar, with his close ties to Washington, has been at the very heart of the push for war by the U.S. against Assad. Ingersoll referred to an article in Britain’s Daily Telegraph about secret Russian-Saudi talks alleging that Bandar offered Russian President Vladimir Putin cheap oil in exchange for dumping Assad. Update: The rush to attack Syria by the Obama administration is being prepared in contempt of international law, democratic processes and in contempt of public opinion in the USA itself. This was made abundantly clear in the presentation US Secretary of State John Kerry delivered from the State Department on Friday, 30 August. On Saturday, 31 August, Russian President Vladimir Putin dismissed as “utter nonsense” the US claims that the Syrian government forces have used chemical weapons. “The Syrian government troops are on the offensive … So giving a trump card to those who are calling for a military intervention is utter nonsense,” Putin told reporters in Vladivostok. The so-called US ‘Government Assessment of the Syrian Government’s Use of Chemical Weapons’ contains not one shred of probative evidence. As emphasised by the website of the International Committee of the Fourth International, the document, barely three pages long, includes a series of unsubstantiated assertions that are tailored to the US policy aim of manufacturing a pretext for direct intervention in a US-provoked civil war aimed at toppling the Syrian regime of Bashar al-Assad. To the question, put to him by Syrian playwright Mohammad Al Attar, which was, “You have a cautious stance on recent Western statements about arming opposition fighters. Why is this?”, Noam Chomsky, interviewed in July 2013, replied: “It is linked to an evaluation of the consequences. 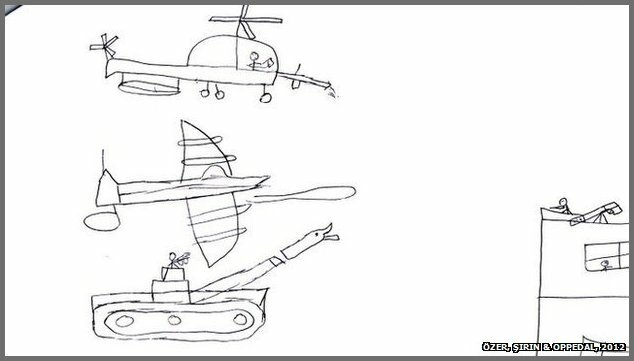 Once again, I believe there are much simpler ways that the West can take before making the leap to military aid, some of which I have mentioned above, but which further include providing increased levels of humanitarian aid. If we are serious, we must look at the consequences of such an action. What would be the result on a humanitarian level? My question is practical, not ethical.” More from the Heinrich Böll Stiftung Middle East. 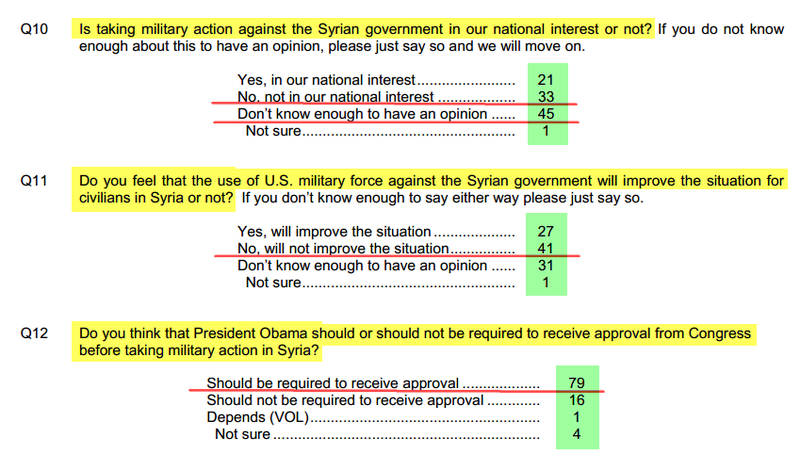 A page extract from NBC’s poll on US military action against Syria. But the views of the reasonable and pacifist many have rarely halted the war charges of the White House. A poll carried out by the American broadcaster NBC has showed that nearly 80% of those polled want approval from the US Congress for military action against Syria. “Nearly 80 percent of Americans believe President Barack Obama should receive congressional approval before using force in Syria, but the nation is divided over the scope of any potential strike,” the NBC report has said. The raw poll findings, which I have extracted from the document helpfully posted in full by NBC, show the clarity with which the polled public view the recklessness of the Obama administration. In particular see the “no, will not improve the situation” and “no, not in our national interest” responses. Older post: There is little point now in switching on any of the mainstream television news channels, for the propaganda campaign has shifted into high gear. The last decade has provided enough practice for such a campaign – war and unrest have become orchestrated as spectacles. There has been Iraq, Afghanistan, Libya, Egypt, Somalia and Al Qaeda. Hence the machinery used to package another war for the public has been well used. The official reasons given for the imminent attack on Syria are unsubstantiated and lies that are fashioned crudely into a bloodthirsty collection of pretexts to justify a policy planned well in advance. Shoved aside are the voices that are calling for the investigations to find evidence of the alleged gas attacks inside Syria, to let dialogue and diplomacy dominate all interactions, to give all sides a hearing and count all views. On 28 August 2013, with United Nations Secretary-General Ban Ki-moon and other UN officials urging continued cooperation, the UN team investigating alleged use of chemical weapons in Syria visited several locations in the suburbs of Damascus, including impact sites, where it collected additional information and samples. That work must continue, as Syria itself has asked the UN, speaking through its permanent representative to the UN speaking on 28 August 2013 (see this video clip). On 25 August 2013 the Spokesperson for UN Secretary-General Ban Ki-moon said on 24 and 25 August 2013, the High Representative for Disarmament Affairs, Angela Kane, met with senior officials of the Government of the Syrian Arab Republic. “The purpose of her visit was to seek cooperation of the Government in facilitating an expeditious investigation of the incident in the Ghouta area on 21 August involving the alleged use of chemical weapons,” noted the statement. The UN Secretary-General instructed the investigating mission which began its on-site fact-finding activities on 26 August 2013, that is, only three days ago. And yet the governments in Washington and London are ferociously claiming there is no need for a UN Security Council resolution on what form of intervention to make in response, and indeed for the investigations to cease so that war can commence immediately. For the USA and Britain – and their supporters in Germany and France and a few other countries – to threaten to or to militarily strike at Syria is a blatant violation of the United Nations Charter – which has not been mentioned by Barack Obama or David Cameron. The UN Charter requires countries to settle their international disputes peacefully. Article 2(4) makes it illegal for any country to either use force or threaten to use force against another country. Article 2(7) prohibits intervention in an internal or domestic dispute in another country. The only time military force is lawful under the Charter is when the Security Council approves it, or under Article 51, which allows a country to defend itself if attacked. None of the governments now howling for war were attacked. 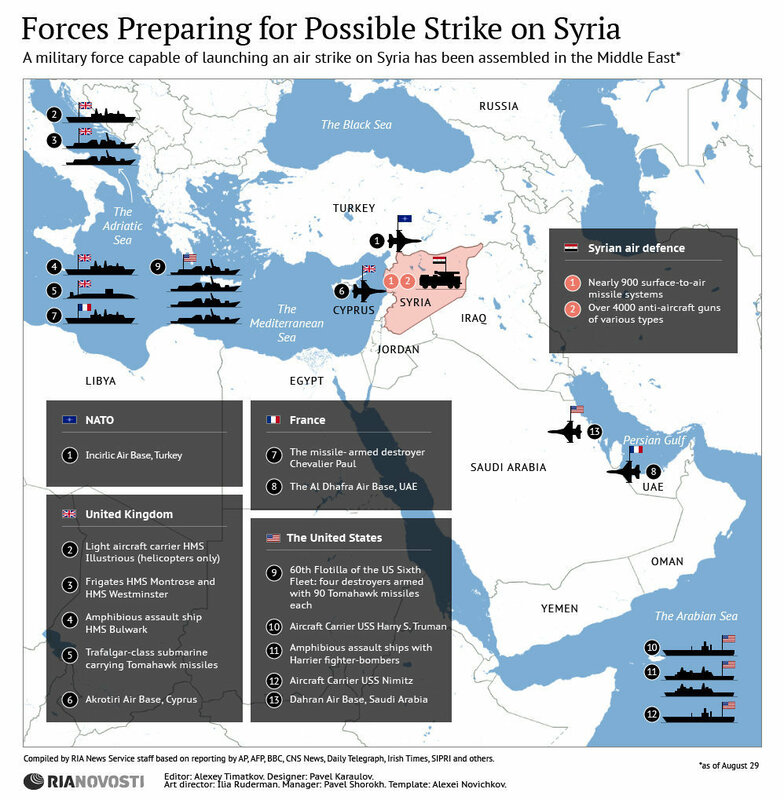 A graphic by Ria Novosti showing the build-up of military in the Mediterranean and surrounding Syria. Writing in The Guardian, Hans Blix reminded us that “In 2003 the US and the UK and an alliance of ‘friendly states’ invaded Iraq without the authorisation of the UN Security Council. “A strong body of world opinion felt that this constituted a violation and an undermining of the UN charter,” wrote Blix. “A quick punitive action in Syria today without UN authorisation would be another precedent, suggesting that great military powers can intervene militarily when they feel politically impelled to do so.” Blix was the head of the UN monitoring, verification and inspection commission from March 2000 to June 2003. In 2002, the commission began searching Iraq for weapons of mass destruction, ultimately finding none. We can expect that Russia and China, on the UN Security Council, will use their veto to halt an Anglo-American war on Syria. That is why the USA and Britain have been assembling warships in the Mediterranean – were these warships there before the alleged gas attacks in Syria? That is what responsible media should be asking governments in Washington and London. Nonetheless, there are more reliable news sources to turn to. The Russian news website RT is running a ‘Syria ‘chemical weapons’ crisis live updates’ page. Ria Novosti is also covering the crisis and you will reports such as “Russian President Vladimir Putin and his Iranian counterpart, Hassan Rouhani, have discussed the situation in Syria, condemned the use of chemical weapons, and called for a political settlement”. And the People’s Republic of China has its global news service, Xinhua, which has reported Syrian President Bashar al-Assad as having said that his country “would defend itself against any foreign aggression, stressing determination to ‘eliminate terrorism’ in the war-weary country”. 1) China is the world’s biggest grain producer and maintains a standing policy that forbids growing GM grain. But China does allow imports of certain GM products. In 2012, China imported over 58 million tons of soybeans – mostly genetically modified. Public opinions on GM crops in China are polarised, with a great number of people holding suspicions toward GM products. Rao Yi, a professor and dean of Peking University’s School of Life Sciences, said that while some GM-related concerns still need to be discussed, there are also rumors that need to be dispelled. Domestically-grown soybean is scarce in China, as China’s imports of GM soybeans rocketed to 58 million tons from less than 3 million tons in 1997. Many farmers have abandoned soybeans for other crops, as imported soybeans are cheaper. GM technology is the future of agriculture, said Fang Zhouzi, a biochemist and vocal supporter of GM technology, adding that it will be harder for China “to catch up with the USA” if China does not recognize this fact. 2) Cargill, the world’s largest food company, has been secretly amassing land from small farmers in eastern Colombia, despite a law prohibiting the practice. When the two countries signed a free trade agreement last year, Cargill emerged as the owner of 52,574 hectares where it grows corn and soybeans. The small farms in the isolated high plains of Vichada department in eastern Colombia were given to poor peasants in the 1990s under a scheme to convert ‘wasteland’ in an area that had become a stronghold for the lucrative cocaine trade. Colombian law prohibits any one person or entity from owning more than one “agricultural family unit” of this land in an effort to diversify land ownership in a country where most land is owned by a small wealthy minority. 3) The profound impacts of the agribusiness model know no borders between rural and urban. In rural areas and outer suburbs they are measured in terms of agrotoxin poisoning, displaced farmers (who swell the ranks of the urban poor), ruined regional economies, correspondingly high urban food prices, and contamination of the food supply. Ultimately, what we are looking at is a social and environmental catastrophe settling like a plague over the entire region. Wherever you live, you cannot ignore it. The handful of people and companies responsible for this chain of destruction have names: Monsanto and a few other biotech corporations (Syngenta, Bayer) leading the pack; large landowners and planting pools that control millions of hectares (Los Grobo, CRESUD, El Tejar, Maggi, and others); and the cartels that move grain around the world (Cargill, ADM, and Bunge). 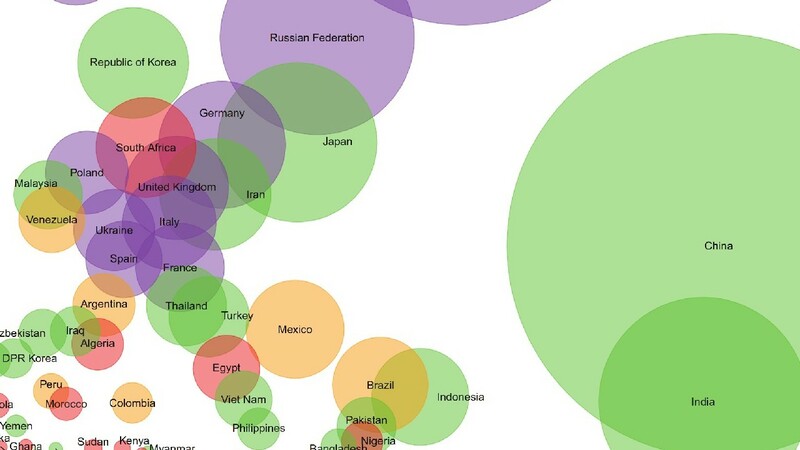 Not to mention the governments of each of these countries and their enthusiastic support for this model. To these should be added the many auxiliary businesses providing services, machinery, spraying, and inputs that have enriched themselves as a result of the model. To put some numbers on the phenomenon, there are currently over 46 million ha of GE soy monoculture in the region. These are sprayed with over 600 million litres of glyphosate and are causing deforestation at a rate of at least 500,000 ha per year. 4) The 2013 World Food Prize has gone to three chemical company executives, including Monsanto executive vice president and chief technology officer, Robert Fraley, responsible for development of genetically modified organisms (GMOs). Yet, GMO seeds have not been designed to meet the Prize’s mandate and function in ways that actually impede progress toward the stated goals of the World Food Prize. Almost twenty years after commercialisation of the first GMO seeds, by far the most widely used are not engineered to enhance nutrient content, but to produce a specific pesticide or to resist a proprietary herbicide, or a combination of these traits. Even in reducing weeds, the technology is failing, for it has led to herbicide-resistant “super weeds” now appearing on nearly half of American farms. This award not only communicates a false connection between GMOs and solutions to hunger and agricultural degradation, but it also diverts attention from truly “nutritious and sustainable” agroecological approaches already proving effective, especially in the face of extreme weather. Developed and controlled by a handful of companies, genetically engineered seeds further the concentration of power and the extreme inequality at the root of this crisis of food inaccessibility.